The VRF system is the ideal solution for combining environmental comfort, energy saving and reduction of CO2 emissions with a single system for heating and cooling your environments. 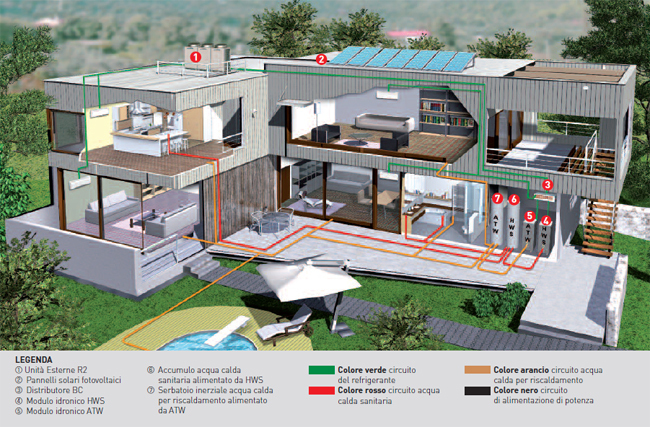 The heat pumps technology is implemented with the indoor units for the production of hot water for sanitary use (HWS) and for the heating with radiant panels (ATW), perfectly integrated with the insertion of solar panels in the system. Plants with electric heat pump systems can operate throughout the year, as unlinked from any legislative constraint. The air conditioning during spring and autumn is an additional comfort of this type of plant. The indoor units of VRF systems cool and slightly dehumidify the premises in the spring, while cooling and dehumidifying in the summer, transferring energy from them to the HWS and ATW units, and slightly heat the environment during the cooler hours in the fall. The indoor ATW units provide hot water for heating through radiant panels in winter and feed with hot water any pool in summer, contributing to the maintenance of the temperature. In summer you can send cold water to the radiant panels for cooling floors. The design office Airclima is ready to give advice without obligation to individuals, architects, interior designers and construction companies. Book an appointment at home to Milan to talk to our experts and design your system VRF or VRV heat pump for your environments. 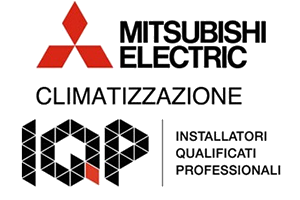 If you book a visit to your home, one of our technicians will be to assess the situation and to propose the system VRF / VRV Mitsubishi that best suits your needs.